A. I’m watching TV or at the computer. B. I haven’t eaten enough earlier in the day. C. I’m out, or at a party or gathering. D. I’m stressed out or alone. A. A bag of chips. B. A large fast-food burger on the run. C. A bucket of movie popcorn. D. Chocolate or a bowl of ice cream. A. Watch TV or go online. B. Eat dinner — I usually get home or work late. C. Socialize with friends or family. D. Try to relax — I have very stress-filled days. B. A go-getter. I’m always juggling a million things. C. A social butterfly. I’m always with my friends. D. A drama queen or king. I tend to stress out a lot. A. It didn’t help. I dieted, watched what I ate, but ended up gaining #weight. B. I didn’t have enough time to think about what to eat. C. It was too hard to stick to when I was out with friends. D. I couldn’t give up my favorite foods. A. Snack while answering e-mails or talking on the phone. B. Skip lunch; I just don’t have the time. C. Am the first one to indulge when someone brings food to the office. D. Eat at my desk when I’m working on a big project — it relaxes me. SCORING: See which Diet Trap you’re most likely to be dealing with, so you can learn what makes you overeat and how to cope. You’re sitting in front of your computer, tired and bored, so you open a drawer and pull out a box of cookies left over from a birthday party the week before. First it’s just one cookie. Then it becomes two. Before you know it, the whole box is gone. Sound familiar? You just consumed well over 1,800 #calories. Or, perhaps you pick at food all day while doing tasks but don’t really taste what you’ve eaten after the first bite. Or you sit in front of the TV and eat a large bag of chips without even noticing. I can’t tell you how many times I’ve been at the movies, engrossed in the film, munching on a bucket of popcorn and a box of candy, when, all of a sudden, I put my hand in the popcorn container and there’s nothing left. I could have been chewing on cardboard and it would have tasted the same. It was a waste because I wasn’t paying attention to the popcorn, so I didn’t even enjoy it. You can put away thousands of extra calories just like that: by eating without thinking. Figure out your danger zones. TV, office computer, video games, etc. … You might want to post a notice: “Think Before You Eat.” At work, you can create a no-food zone around your desk or work area. Make sure your co-workers know. Drink more. Make sure to have low- or no-calorie beverages available. Drinking can fill you up and keep your mouth occupied, without filling out your waist. Have low-cal options around. Always keep healthy Calorie Bargains available, and avoid having unhealthy food in the house. If there is unhealthy food in your house, that’s what you’ll probably eat. For instance, instead of buying chips, try bags of 100-calorie snacks. You can also portion your food in advance, not when you’re in a trance. Pack up your foods in healthy portions so that when you go to grab, you already know that what you’re eating is a healthy amount. Stay mindful. Try to enjoy the smell, taste and texture of anything you eat — that way you won’t drift into a “food trance” and empty the bag of Cheetos. 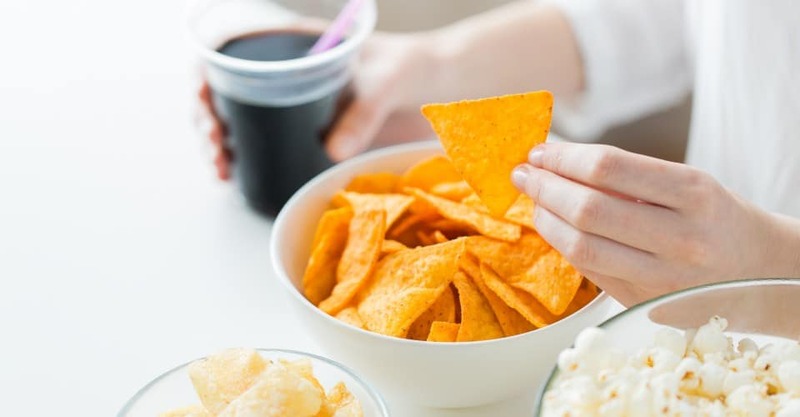 Keep in mind that random bites of anything can add up, but just by paying attention, you can save a lot of calories. As a rule, never eat anything with more than 100 calories without taking at least 10 seconds to decide if it’s really worth it. Is it a Calorie Bargain or a Calorie Rip-Off? Don’t snack, have real mini-meals. It’s better to have half a turkey breast sandwich than a box of cookies. Create mini-meals so that you’re satisfied. Eat in volume. Make sure you pick snacks that are so low in calories that it doesn’t matter if you eat a lot (e.g., air-popped popcorn, low-calorie cereal). Prepare. Write down how you entertain your mouth, and prepare for the next time. What are you going to do to make sure it doesn’t happen again? How often have you been on the go and not eaten for a long while? As soon as you see a coffee shop, deli or a fast-food restaurant, everything on the menu looks delicious, so you overeat because you are hungry. You skip breakfast because you’re on the run, and you’re really not that hungry. Or, you could really go for something but don’t have the time, or your kitchen cabinets and fridge are bare. Before you know it, 2 p.m. has rolled around and you’ve had nothing but a few cups of coffee and maybe a buttered roll. You’re primed to eat the first thing that crosses your path. Typically, in that situation you don’t sit down and think about what would be healthy. Your body is telling you you’re hungry, you’re preoccupied with your work (or your kids), and a co-worker or friend comes over holding out an open box of chocolate chip cookies. You take three, scarfing them down so fast your mind doesn’t even register that you’ve eaten. Before you know it, you’ve downed six cookies. Make time to eat. Don’t skip meals or wait too long between meals (keep healthy snacks like a small handful of nuts, some cut-up veggies, or low-cal cereals in your pocketbook or briefcase just in case). Skipping meals may seem like a diet shortcut, but in no time it will become a diet detour — because your body will simply rebel. Set it up. No matter how tired or rushed or stressed you may be, don’t skip breakfast (or any meal, for that matter). The research is overwhelming that eating breakfast helps you control your weight. Find healthy fast-food breakfasts by looking online at the various menus and picking the healthiest choices (e.g., an Egg McMuffin, at 300 calories is certainly better than nothing). Create a standing order at the local deli for breakfast to be delivered to your office. Bring fruit for a mid-morning snack so you don’t overeat at lunch. Make your food choices in advance. Decide in the evening what you’re going to order for breakfast the next day, or stock up on convenience breakfast foods that are healthy (e.g., Egg Beaters). Make sure to bring your own healthy lunch or have healthy choices available at the eateries in your area (create a menu book and circle all the healthy foods in advance). Think ahead and know the better-for-you choices at your office vending machine, office cafeteria or in your neighborhood. Stock healthy frozen foods (e.g., Healthy Choice, Kashi and Lean Cuisine) or foods that require just a microwave, such as soups with less than 120 calories per cup — they fill you up fast. Social eating is a little different from mindless eating because you probably are paying attention to what you’re eating — you just “excuse” yourself because you’re with your friends or because it’s a special occasion. You’re having so much fun that you’re not worrying about calories. You’re sitting at a restaurant, having a great conversation with family or friends, and the bread basket is on the table, along with an excellent bottle of red wine. You’re enjoying yourself. You eat a few pieces of bread, dip it in oil, and have a couple of glasses of wine. For the time being, you’re oblivious to what you’re consuming — or perhaps you just let yourself off the hook, figuring, hey, you only live once, and food is a major part of the whole social experience. Keep track of what you’re eating when socializing. Eat with a plan. Even when you’re socializing, don’t just wing it. Have an idea of what you’re going to eat before you get in the thick of it. For example, plan on ordering a Calorie Bargain, like salad or low-calorie soup, instead of taking from that bottomless bread basket. Learn to spot the low-cal options on the menu. Seek them out. Make it a game, and keep it social. Eat before parties or any social gathering. Don’t go starving. Don’t feel obligated to eat a bunch of snacks just because someone offered them. Learn to say “no” with style. “I’ve had the worst day. I’m going home and curling up on the couch with a pint of Ben & Jerry’s!” Whenever you’re feeling stressed or irritable or depressed, you know you can count on food to cheer you up. Why? We tend to link food with the way we feel, and many foods remind us of happy occasions. In fact, certain foods — like anything loaded with carbs — can even affect our brain chemistry to make us feel calmer. So what’s the big deal about a few extra calories and fat grams? Well, while food can offer comfort during emotional uncertainty, most experts stress the importance of maintaining control over your internal environment despite the fact that external factors may be unstable. Being able to look inward and feel good about your nutrition and #health is critical. Avoid sugar crashes. Eating junk foods could leave you feeling tired and unsatisfied. For a better carb boost, have anything with 100 percent whole grain. Keep stress under control. Come up with non-food ways to take control. Here are some examples: Take a walk (or any exercise); take a bath; call a friend; go to a movie and bring along healthy foods; blog online (www.blogger.com); get a manicure; take your dog for a walk; read a good book; or listen to music.